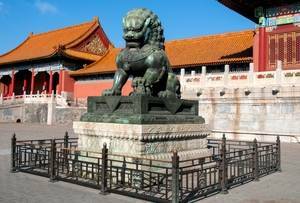 The Forbidden City is the imperial palace of Chinese rulers from the early fifteenth century to the beginning of the twentieth century. It is a magnificent ensemble of palaces, pavilions, courtyards, gardens in which have been placed a large number of Symbols. They were mostly related to the decorations of the pavilions. These sets are generally of a high quality and they have been made with infinite care. Here are some examples of decorations that can be seen there. 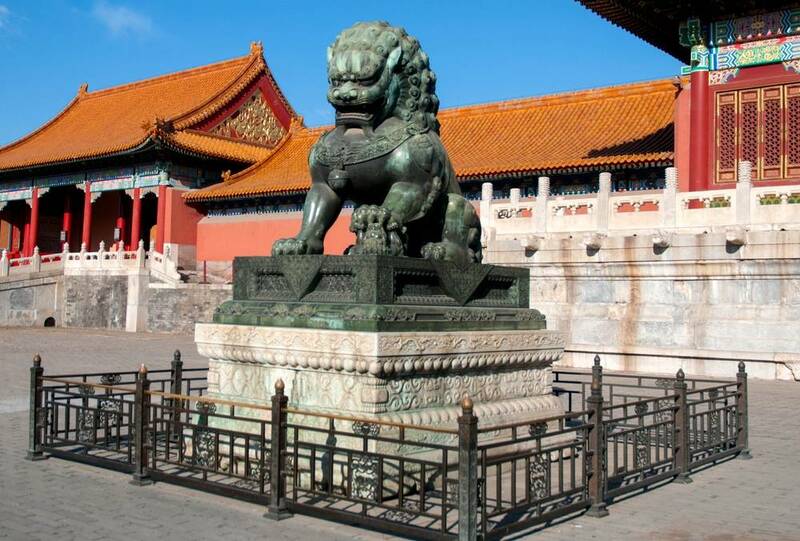 The pavilions of the forbidden city are painted in red, at least that's the color we see today. Because for the Chinese of feudalism it is purple, the color of the polar star. 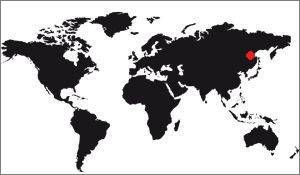 Yes, the polar star is, in the Chinese imaginary of the Middle Ages, purple. And since this star is fixed in the sky, as the universe seems to turn around, it has been associated with the Emperor who represents the center of all things. This color therefore has a symbolic role, it represents the order, the center of the centers, the perfect point of the universe, a point where the emperor is permanently located. There are some exceptions with some pavilions painted green, but it is far from the majority. 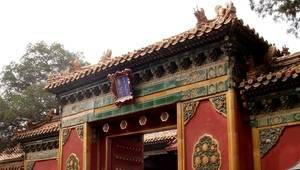 As for the roofs, they are made of yellow glazed tiles for the most important pavilions, the yellow being the color of the emperor. Moreover, the latter was mostly dressed in yellow, especially during his younger years. Yellow and red were therefore the two colors of the Chinese Empire. 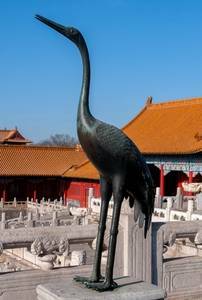 The statues of the forbidden city are essentially composed of representations of animals. They are often with demonic faces, they represent guards (most of the time) intended to prevent bad people from entering a place. Thus, below, we find pell-mell a dragon, a heron, a turtle, a lion and a lioness, etc. 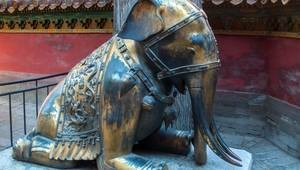 All these animals are in bronze, but sometimes they are found in marble. Generally, in this case, they are stylized. The storks and bronze turtles are symbols of immortality, which is why they are associated with the emperor. A lioness on her pedestal. The design of the roofs is interesting. There are 10 kinds of different roofs in the palace, which are characterized by the presence or absence of a projection, its pyramidal or trapezoidal shape, the presence of a pinion, etc. Little by little the characteristics of the roofs will become very symbolic, relegating the fact that, first and foremost, they are intended for protection. The highest level of roofing is reached by the Supreme Harmony Pavilion. It has ten mythical animals at each of its angles, which shows the superiority of those who are sheltered beneath. These mythical animals are characteristic of Chinese architecture. Among them are a phoenix, a lion, a celestial horse and a sea horse, Suanni the dragon-lion, the dragon-kiss, Yayu the dragon-fish, Douniu the bull and Xingshi, the monkey. The dragon-kiss is supposed to be one of the nine sons of the dragon, he has the ability to control the fire. The phoenix brings happiness and luck to the building on which it is located; the lion indicates the power of the owner; horses show their ability to reach the sky and the sea; Suanni, also one of the dragon sons, is the king of the animal kingdom; Yayu, the dragon-fish, is able to collect clouds and put out the fire; Haetae, a unicorn, is synonymous with justice and right; Douniu, the fighting dragon, fights for peace; and Xingshi, the monkey, is an animal intended to prevent the destruction of the building by lightning. 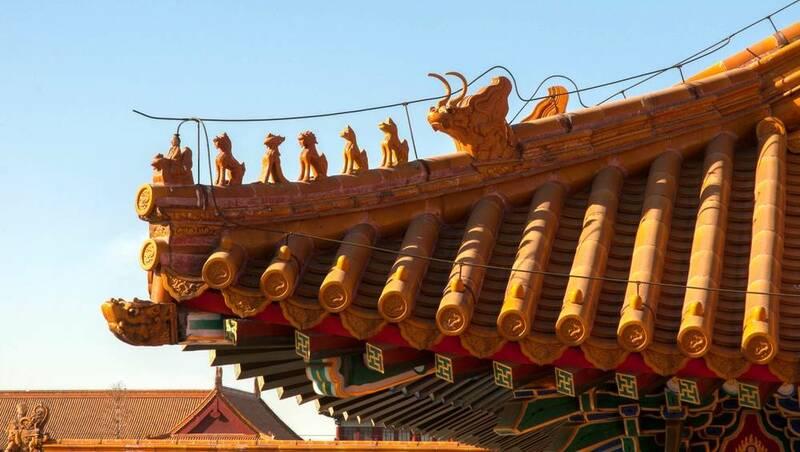 In practice these animals are heavy architectural elements which favor the maintenance in place of the roof, it is the initial role of these representations, but they quickly had a symbolic role, as we have just seen. The number of animals is an indicator of the power of the one living below, the higher the number, the more powerful it is. It is thus the pavilion of the supreme harmony which has the record, followed by the hall of the harmony of the medium and finally the pavilion of the Preserved Harmony. 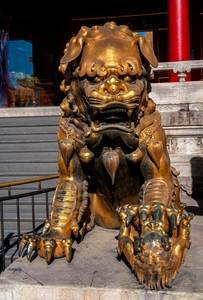 A Huabiao is a large marble column, entirely carved and surmounted by a squatting lion. There are two on each side of the south gate. 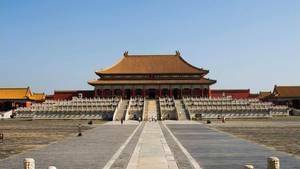 The two who are inside the palace are called "Call to the Exit of the Emperor", they look inward of the palace and their role is to remind the emperor to regularly go out of his palace to meet the people and take his grievances. 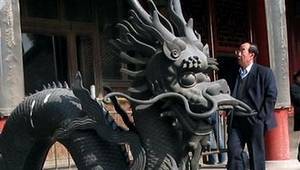 The two who are outside the gate of the South are destined to wait for the return of the emperor when he left. These four columns are therefore essentially symbolic, they have no practical role. 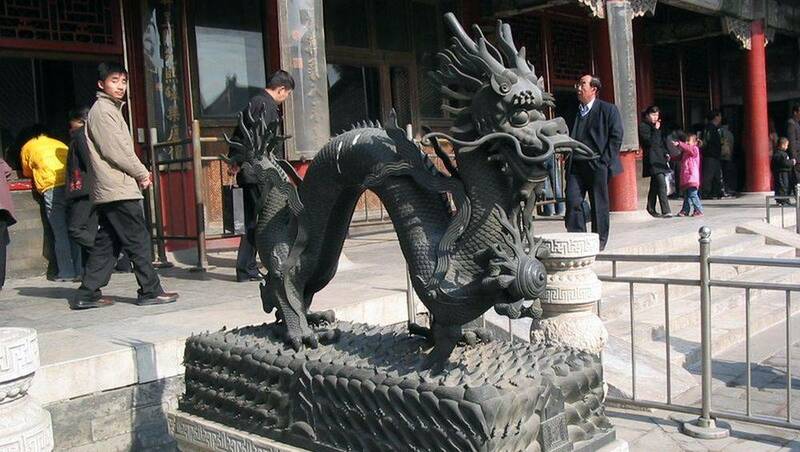 They weigh 10 tons and the carved drawings represent a dragon that wraps around the column. Two marble wings come out of the pillar on the upper part. We are talking about the central staircase in the outer courtyard, the one that goes up to this palace. 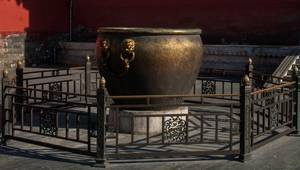 It could only be used by the Emperor. 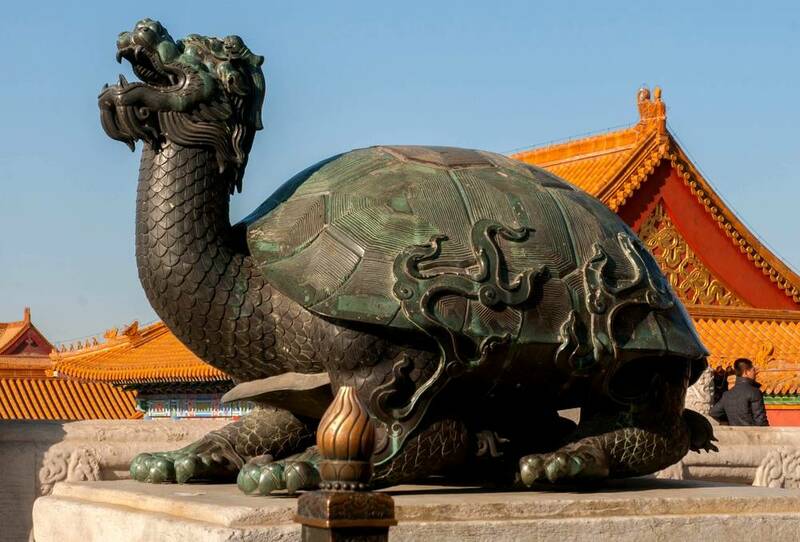 It is remarkable because in its center is a slab of 250 tons measuring 16m57 x 3m07 x 1m70 on which is engraved a succession of beautiful dragons. This fresco is called "Dragons floating among the clouds". The pavilions of the forbidden city are richly decorated with many paintings, with the notable exception of the apartments of the emperor and the rooms of state in which it usually holds hearing. It is rather curious but it echoes the fact that the emperor is supposed to be the most perfect being of the universe, in the center of everything, so his entourage can be made only perfect geometric patterns and not of artistic works. Nowadays a large part of the collection of paintings of the Forbidden City are in Tai Pei, the capital of Taiwan. They had been reunited by the various emperors, who were generally fond of art and often themselves poets or painters. Frames and paintings never enter the decoration of large imperial apartments. The majesty of the throne admits only simple ornaments, noble and august as itself. The paintings are relegated to the cabinets, galleries and garden rooms. See also the collections of the museum. There are other decorative pieces in the courts of the Forbidden City, these are large bronze pots, often placed on either side of a door. One more to have a decorative role, they served to extinguish a possible fire that would occur there. It is also a use of the river of golden water, in the outdoor courtyard. Each pavilion is clearly visible with a blue sign with Mandarin inscriptions. As you would expect, this is the name of the pavilion. These panels are particularly successful, with deep blue and a gold frame. The decorations of the doors, when they are on stone walls, are often made with ceramics. The green color and the yellow are the most used, but not that, for example the big fresco of the 9 dragons which is in the palace of Qianlong has a blue background. Otherwise the walls, deep red, are regularly decorated with patterns that are not expected to find here. We see - partially - in the photo above which concerns the door of the culture of the mind: It is about floral motifs girdled in a sort of mandorle yellow. The stems of flowers - and fruits - are very worked and form a mesh of high quality. By cons, this kind of reasons, we expect to find them on the Taj Mahal, the famous Indian mausoleum, and not right here.